The first day of the NCAA Tournament didn’t have a Cinderella feel to it. Both Villanova and Gonzaga won their matchups, while the lower seeds who did win, Xavier and Middle Tennessee, weren’t causing major shocks while doing so. Northwestern, playing their first ever Big Dance game, beat Vanderbilt and advanced to the round of 32. #16 Mount St Mary’s 56 #1 Villanova 76: No problem for the defending national champions, although it was just a 1-point lead at halftime. The Wildcats didn’t force turnovers or do all that well defensively early on, but they shot 51.7% from the field and dominated the boards. Donte DiVincenzo led the way with 21 points off the bench. Villanova will play Wisconsin next. #15 North Dakota 82 #2 Arizona 100: The Wildcats took off early with 53 first half points, and the Fighting Hawks couldn’t keep up. Lauri Markkanen and Rawle Atkins each scored 20 points. Arizona, without a Final Four appearance since 2001, will face Saint Mary’s next. #13 Vermont 70 #4 Purdue 80: After 28 minutes of keeping up, the Catamounts slowly faded away and allowed Purdue to take over the game. Six Boilermakers scored in double figures, including Vince Edwards with 21 points. Purdue will face Iowa State next. #14 Florida Gulf Coast 80 #3 Florida State 86: Dunk city didn’t turn into another small sensation, trailing the entire second half before making it a bit closer in the end. The Seminoles weren’t very impressive, but had a 10-point advantage from the line which made the difference. Dwayne Bacon scored 25 points with his 9 rebounds to lead them. Xavier are next for them. #12 Nevada 73 #5 Iowa State 84: The Cyclones shot 42% from beyond the arc, and Nevada weren’t capable of coming close to that. Monte Morris was terrific as he begins his final NCAA Tournament, leading Iowa State with 19 points. They’ll play Purdue next. #10 VCU 77 #7 Saint Mary’s 85: The Gaels are in the round of 32 for the first time since 2010 and only third in the program’s history following their win over the Rams. VCU managed to erase a 17-point deficit, but it was only to come close, not really make a difference. Jock Landale, who had a breakout season, led Saint Mary’s with 18 points. They’ll face Arizona next. #9 Virginia Tech 74 #8 Wisconsin 84: The Badgers looked a lot better than expected with their win over a hot V-Tech team, scoring 50 second half points, showcasing the shooting of Bronson Koenig with 8 three-pointers. It was Nigel Hayes in the end who helped the Badgers breakaway in the end. Wisconsin play Villanova next. #11 Xavier 76 #6 Maryland 65: Far from a surprise, but Xavier are the lowest seed to advance on their side of the bracket. The Musketeers held the Terps scoreless for a 4-minute stretch in the second half which helped them gather a big enough lead, and the scoring of Trevon Bluiett made the difference too. Xavier play FSU in the round of 32. #16 South Dakota State 46 #1 Gonzaga 66: A rough first half was replaced with dominant ease in the second, as Gonzaga made it through their first test, as they attempt to make it to the Final Four for the first time in school history. Both teams shot under 40% from the field, but the Zags offensive rebounding made things easier. They play Northwestern first. #13 Bucknell 80 #4 West Virginia 86: As expected, the Mountaineers didn’t have an easy day against the Patriot league champions, keeping a lead throughout the game but never feeling truly comfortable. Tarik Phillip led WVU with 16 points, who’ll face Notre Dame next. #12 Princeton 58 #5 Notre Dame 60: The first game of the tournament almost ended in a massive upset, but the Fighting Irish enjoyed a bit of luck as they saw the Tigers miss two go-ahead shots, losing their composure by taking long 3’s instead of closer shots. Bonzie Colson scored 18 points, and will be up against West Virginia next. #13 Winthrop 64 #4 Butler 76: Butler didn’t trail once in the game as their defense held the Eagles for most of the game without serious runs. Avery Woodson scored 18 for the Bulldogs, who’ll be playing Middle Tennessee next. #13 East Tennessee State 65 #4 Florida 80: Devin Robinson got hot in the second half to help Florida break away from the pesky Bucs, in a wild game with 32 combined turnovers. Florida are back in the round of 32 for the first time since 2014, and will face Virginia next. #12 UNC Wilmington 71 #5 Virginia 76: 147 points in a Virginia game? Weird. Virginia came from behind (15 points down at one point) to avoid a massive upset, led by London Perrantes with 24 points. It’s Florida next. #12 Middle Tennessee 81 #5 Minnesota 72: The biggest upset on paper when going by seeing, but the Blue Raiders were favored to win the game. They’re in their second consecutive round of 32, and will face Butler next. 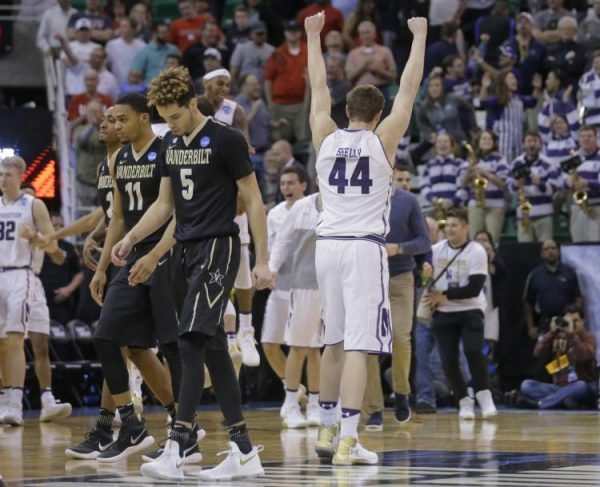 #9 Vanderbilt 66 #8 Northwestern 68: Vanderbilt made some idiotic mistakes in the final minutes to blow a lead, but the feel-good story of Northwestern continues, as the team in its first ever NCAA Tournament moves on to the round of 32, where it’ll face Gonzaga.